Despite some lethargic saving routines throughout setup, the R50 proved a nimble performer during normal operation. Macros transmit quickly, pages and devices change instantly. There is, however, one specific instance of key lag. First, I should explain a little about the remote’s power management. Whenever a normal in-device hard button is pressed, the LCD automatically activates at a low brightness level. 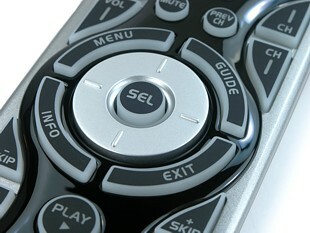 When one of a grey system buttons or an LCD key is used, the LCD comes up to full brightness. Of those keys, only the [Main] and [Fav] keys will perform their functions on the first press when the screen is off; the rest require a second push. When the remote is powered down (as it does after a few seconds of inactivity), there is a moderate amount of lag between pressing one of the normal hard buttons, the screen activating at a low brightness, and the attached command actually transmitting. This in itself isn’t unbearable, but I also discovered a problem whereby some learned commands may be transmitted so briefly after the remote wakes up that the device is unable to sense them. Upon further testing I noted that database versions of the same functions did not experience this, and the learned commands work normally once the remote is awake... so the issue only occurs with learned codes and the R50 powered down. The R50’s matte rubber keypad offers soft but definite tactile response, and unlike the MX-900 there’s enough of a “click” that you’ll know exactly when a key has been fully pressed. The new flat 5-way cursor control disc gets the job done, although in comparison I prefer some of URC’s other, more sculpted versions from past remotes. I was initially concerned about the thin quarter-circle buttons that surround the cursor pad, as similarly shaped keys have historically performed poorly, but they work absolutely fine on the R50 and are detected even when only the corner is pushed. All of the R50’s buttons have been logically arranged, with the menu controls in the middle and the numeric keypad on the bottom. Key shapes are different enough that there should be no difficulties using the remote in a dark room without the backlight (or even with, as the case may be). There is one place on the R50 where the ergonomic design gives me pause: the 10 buttons in the 4 silver areas. 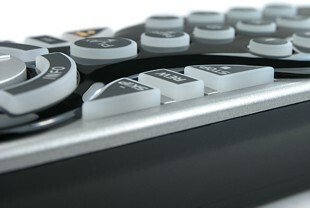 These sections have been sunken a fair amount below the glossy black panel, so that the tops of their keys are actually lower than the surface of the rest of the remote. What makes this an issue is that there’s no space around these buttons, so as they’re pressed the side of your finger comes into contact with the edge of the surrounding black plastic. These keys are also flat-topped, as opposed to soft doming used for every other button on the R50, which makes them feel low already. If these were mere ancillary functions this wouldn’t be of particular concern, but they’re important buttons like [Channel], [Volume], [Fast Forward] and [Rewind]. In spite of these gaffes the large [Volume] and [Channel] toggles remain usable, but the transport controls are a different story with 6 small keys wedged into the space of 4. Thankfully the remote is responsive enough that even awkward off-angle pushes of the recessed triangular keys are sensed reliably, but it looks as though the designer opted for symmetry over usability.